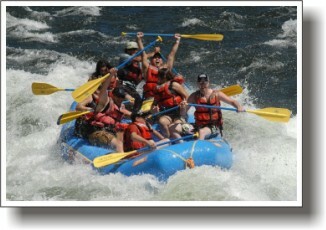 Rafting Trip Departures: Every Saturday June thru September and every Thursday June thru August. 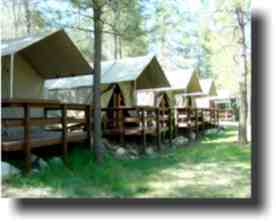 You may arrive the night before your trip for your first nights of camping. Other departures available for groups of 10 or more. Trip Includes: 2 nights camping (cabin tents & river tents are an additional cost), 5 delicious meals (2 breakfasts, 2 lunches and dinner), and 2 days of rafting, the Lower Gorge Run the first day followed by the Chili Bar Run the second day. Our 2 day trip includes 4 delicious meals (plus dinner on weekend trips) and 2 nights camping at our private river front camp where you can enjoy our grass lawn, recreation area with sand volleyball court, ping pong and foosball. 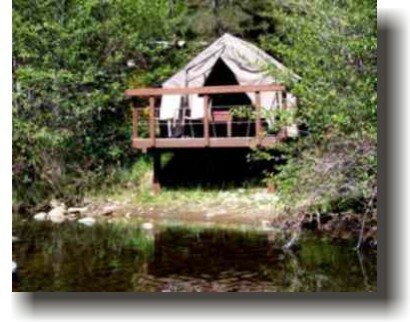 Cabin tents and river tents can be added at an additional cost. You may bring your own tent at no additional cost. Our trip begins with breakfast followed by a a brief trip orientation and safety talk. 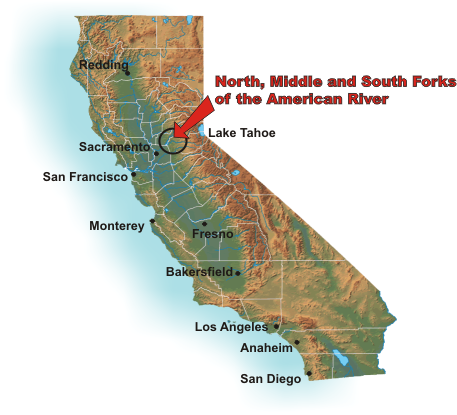 Afterwards we will begin our 13 mile journey down the Lower Gorge of the South Fork American which begins as we float a swift but mellow section of the river allowing everyone to perfect their paddling skills in preparation for the challenging American River Gorge. After a delicious 'deli-style lunch (on midweek trips we have lunch at our camp prior to begining the trip) we enter the Gorge where in quick succession we will bounce, yell, get wet and laugh through Fowler’s Rock, Satan’s Cesspool, Haystack Canyon, Bouncing Rock and Hospital Bar Rapids. 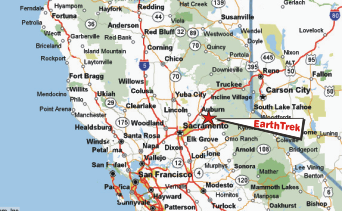 Our journey ends on the warm, still waters of Folsom Lake where an awaiting bus or van shuttles you back to the EarthTrek Camp where you can relax in our camp and enjoy dinner on your own at a local restaurant Dinner included at camp on weekends). 2 day South Fork Camping trips are scheduled to depart every Thursday and Saturday from Memorial Day Weekend to Labor Day Weekend. You may arrive the night before your rafting trip and camp. Groups of 8 or more may schedule a trip any day of the week. The following schedule details a typical 2 day trip on the South Fork American. Times are approximate and are subject to change due to variations in water releases and water flows. Arrive anytime after 6 PM the day before your trip. Set up your tent on the grass lawn. If you rented a tent from EarthTrek, check our Information Center on the back wall of our Camp Store for details about your rental. Enjoy your evening by the South Fork American River. 10:30 AM: Meet in our amphitheater for trip orientation, go over safety issues and meet the guides. Your guide for the trip will be assigned at this time. Return time to our camp. Relax, cast your fishing line into the river, play a game of volleyball, foos ball or ping pong and enjoy life by the river. 6:30-7 PM: Dinner on your own at your choice of several nearby restaurants. Although we are animal lovers, we are unable to accommodate pets including dogs here at our campground. There is a good quality dog kennel closeby and information may be found on their website at dog-woodsresort com. At our camp, EarthTrek will provide all meals during your stay except for dinner. We do not allow individuals to cook their own meals so please do not bring camp stoves for food preparation. 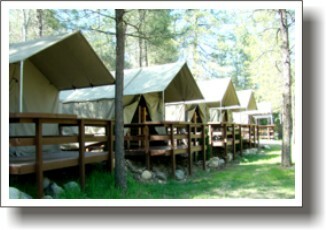 There are several restaurants within walking distance of our camp. Our campground is not equipped for RVs. You are allowed to park your RV in our parking lot and stay in it at night but PLEASE do not run your generator from 10 PM to 7 AM. If you would like to stay at a lodge, bed & beakfast or a campground with RV hook-ups check out our links page for a list of lodging and campgrounds in our area. 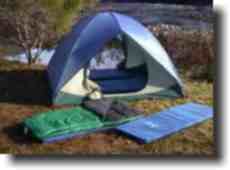 Our standard dome tents are available in 2 sizes, and they are set up when you arrive. Our thick comfortable foam sleeping pads will provide you a good nights sleep. Our sleeping bags come with a freshly launderd cotton liner.